With childhood obesity rates climbing, many schools are looking at ways to make their lunch programs healthier. The Early Show correspondent Tracy Smith reports one school in New York City has found a solution: serving delicious, nutritious food that kids love to eat. Three years ago, the only potatoes in at the lunchroom of Calhoun School in New York would have been the deep-fried ones. Parents like Diane Lois knew a change was needed. "We started looking at what kids were eating at school. And it was frightening," she says. "They would eat a very high caloric lunch that would give them energy in a short amount of time, and they would all be falling asleep and hungry by mid-afternoon and needing another sugar fix." So to give students a healthy boost, the school fired its old food service, and hired a graduate of the French Culinary Institute: Robert Surles, better known as Chef Bobo. Chef Bobo found plenty of healthy food to make, at a cost that was the same as the junk they were serving before. The trick was getting kids to eat it. The children now happily eat roasted cod, arugula salad and potato-leek soup. The saying is: the proof is in the pudding. But in this case, the proof may be on the empty plates and happy faces of the kids themselves. Now Bobo's written a book filled with kid-friendly recipes, to meet a hunger for healthy food that he hopes will grow. Chef Bobo says his ultimate goal is fomenting a "rutabaga revolution." "I want kids to go out of here expecting a higher standard for good food," he says. Chef Bobo's healthy food isn't just a private school phenomenon. 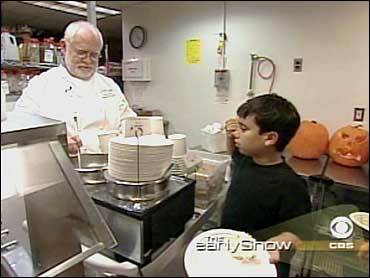 He has trained school chefs from various public schools around the country, and the New York City public schools have talked to Bobo about bringing his ideas to their cafeterias.